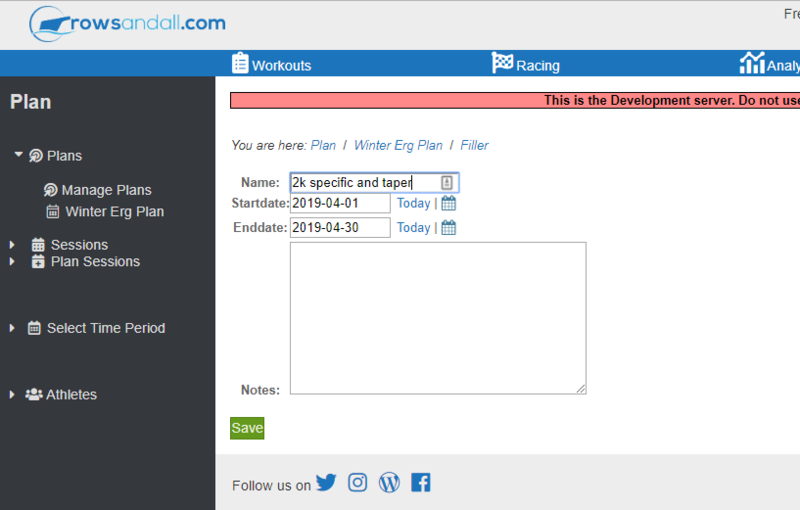 In the previous blog post I explained how rowsandall.com helps you committing to your goals and creating accountability for executing your training plan. This post is a how-to showing you exactly how to create a training plan. So, let’s first add a target. Just fill out the little form to add a target and hit “Save”. That’s all. The target is there. A little note to myself to row a 2k under 7 minutes, by April 30. Now, this is not achieved without putting in some training, and it better be well planned to lead to the right fitness level. So, the next thing I do is create a training plan, starting tomorrow. Again, I simply use the little form on the right. Note that I have set the plan to “active”. Inactive plans are plans that are being prepared. This functionality allows you to prepare a new plan while still working on an old plan. Once your new plan is ready, you deactivate the old one and activate the new one. I didn’t have any plans in this example, so I could make it active right away. 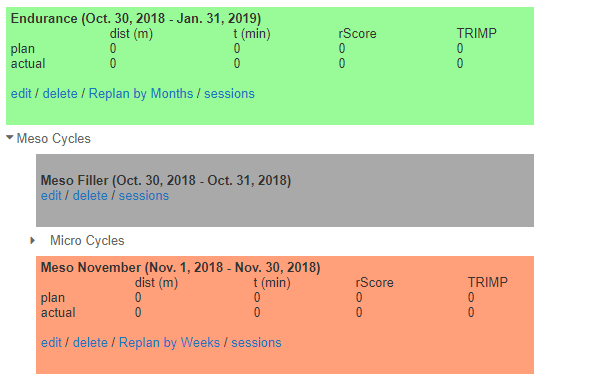 The “Edit” link brings you to a little form where you can update some of the plan details, as well as add your team members (if you are on the Coach plan). 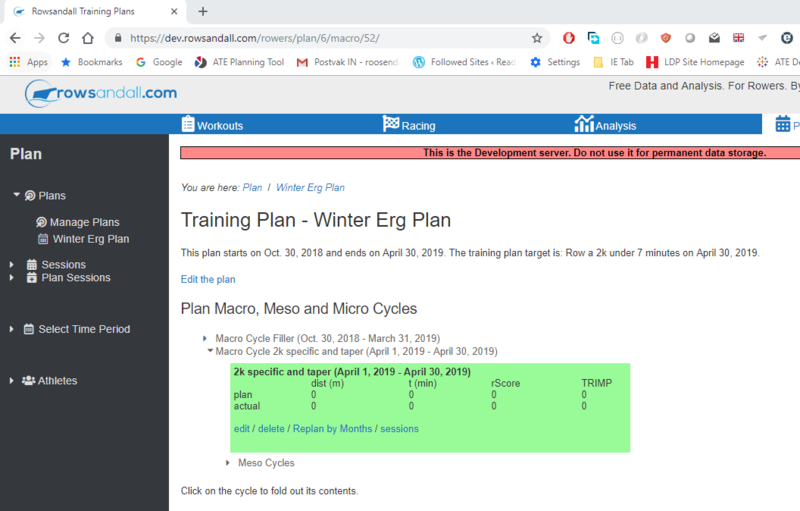 So this plan has an autocreated Macro cycle called “Filler”, which has a Meso cycle of the same name, as well as a Micro Cycle. The image only shows the first three months of this Macro Cycle, but in fact there is also a Meso Cycle for January. Planning Micro Cycles works in just the same way, except that Planning by Months is replaced by “Planning by Weeks”. There is one caveat here. On rowsandall.com, weeks start on Monday and end on Sunday. 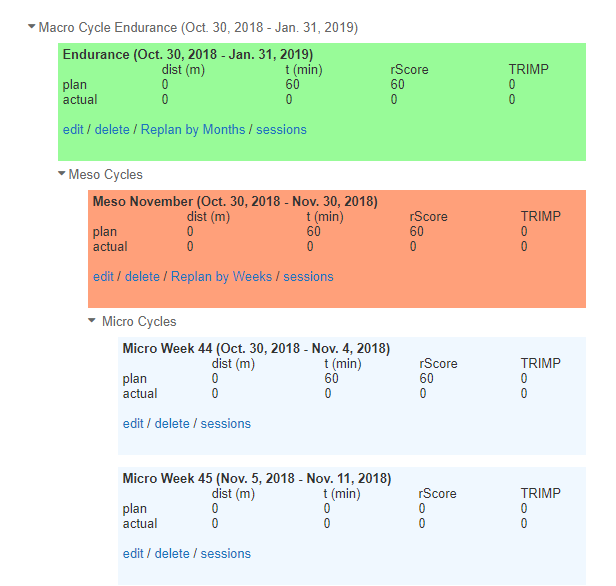 This doesn’t always coincide with the month start and end, so if you plan by months, then by weeks, the first and last Micro Cycle of the month may be a bit longer or shorter. In the future, we will implement an improved user interface to make this a little easier. 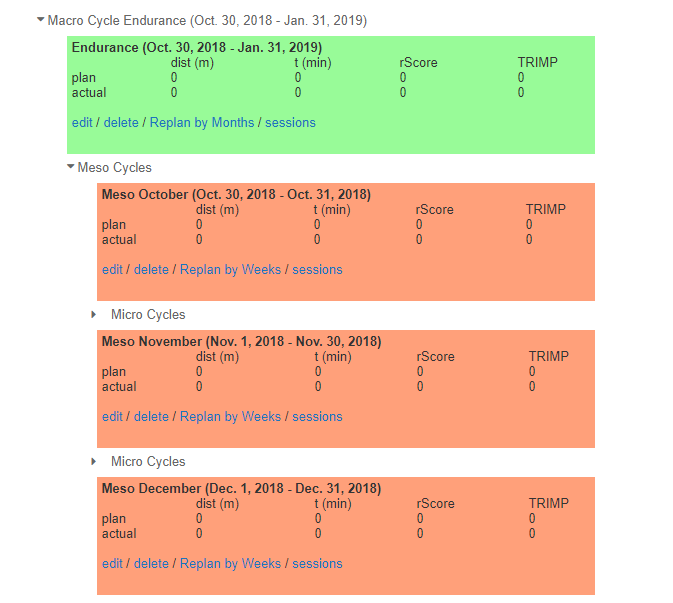 For now, you will spend 10 minutes extra (a few times per year) to get this right, or use a calendar to determine Meso Cycle start and end dates. Now, I have November set up correctly, and I am going to leave it at that. I am going to leave detailing the rest of the cycles to another time. Hey, I already have one training session there. How is that possible? In fact, you can start planning trainings for yourself before you define a training plan. 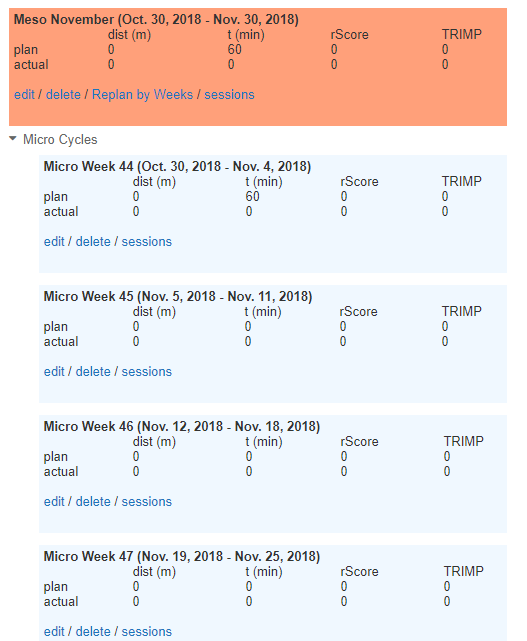 You’re missing out on some of the summary stats and ways to easily browse to a list of sessions for a given cycle, but nobody forces you to put in Micro, Meso and Macro cycles. Let’s just add one new session. We do that by the “Add Session” menu item on the left. 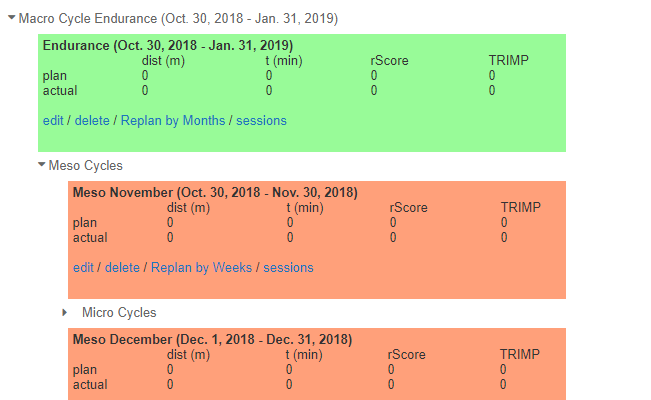 Because we have a Micro Cycle defined, the New Session form has the “On or after” and “On or before” dates pre-filled with the start and end date of the session. Let’s fill out the form and submit it. 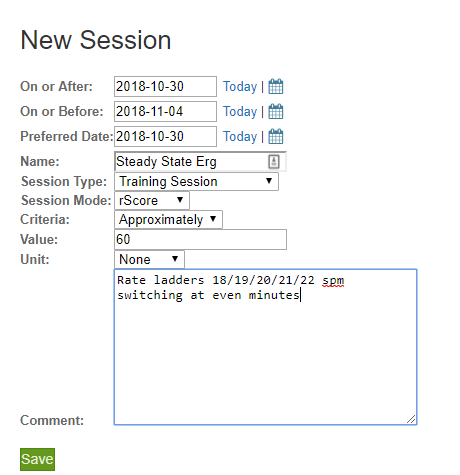 The page automatically reloads with the form to add another new session. The little table on the left gives you the sessions that already exist. You can Edit, Clone or Delete them. 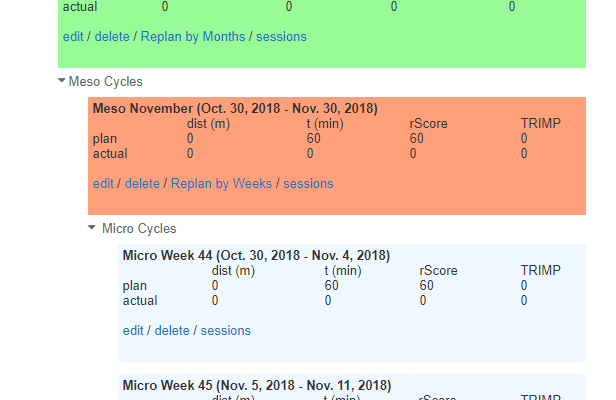 You can see that the Macro, Meso and Micro cycles now contain values for the planned minutes and rScore, for the two existing sessions planned for this week. Now you need to start executing. 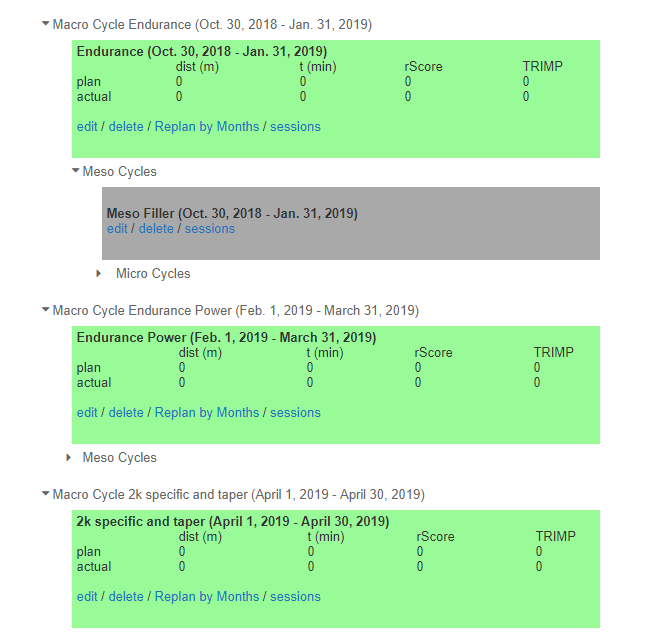 Once you are done and your workout is logged on rowsandall.com, go back to the Sessions overview for the cycle you are interested in, and click on the white circle to go to a page where you can link the session to one or more workouts.